Kimberly Bobka began Training dogs at a young age, teaching her family pets and neighbors’ dogs basic obedience commands. She’s loved dogs since she was just a baby. At age 14 she met a trainer/breeder located in Chicago with whom she learned a great deal of knowledge from and inspired her to further pursue a career in dog training. She volunteered at several shelters and worked at Save-A-Pet in Rolling Meadows caring for dogs that desperately needed homes. 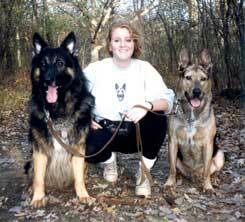 Later Kimberly began training and showing her own dogs in Obedience and Agility and in 1993 Established Teacher’s Pet K-9 School located in Streamwood, Illinois. Kimberly began helping people understand and enjoy a better relationship with their beloved pets. Basic and Advanced Obedience, Problem Solving and Agility were the main services Teacher’s Pet offered. After three years of satisfied customers, many clients were requesting care for pets while they were away on vacation, so Kimberly added Pet Sitting to her list of services provided by Teacher’s Pet. Kim has also been Grooming customers’ dogs since she opened her facility in 1993. 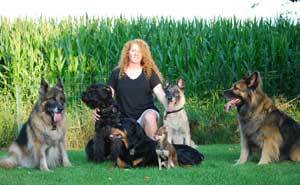 In 1995, Kimberly began dog training for several Police Officers and FBI Agents in surrounding cities. Training 100 to 200 dogs per year, she became familiar with all types of breeds, temperaments and behaviors, as well as, training for Hoffman Estates Park District and providing Seminars on dog training and behavior. In 1997, Kimberly began training dogs and people in Therapy work and certified her half German Shepherd half Pit Bull mix through TDI. She also provided Seminars in nursing homes about training, behavior and Therapy work. Several of her other dogs are also certified Therapy dogs. In 1999, she began working with many shelters and rescues to help re-train and rehabilitate abused and/or misunderstood dogs. Kimberly has also attended numerous Seminars on Canine Behavior and training to further her abilities as an instructor. In 2000, Kimberly moved Teacher’s Pet K-9 School to Sycamore, Illinois, where she also added Doggie Day Care, Boarding and Boarding School to the list of services provided by Teacher’s Pet. She began offering Doggie Day Care to clients who want more socialization and exercise for their dogs with large indoor and outdoor play areas! Every day care dog is temperament tested and screened for health and updated vaccination records by Kim personally. Kimberly’s expertise in canine behavior and temperaments essentially match dogs with similar personalities for day care safety. Also in 2000, she became a Certified Obedience Instructor and began training for Animal Behavior and Training Associates in Petco stores. Soon after, Petco hired Kimberly as their own training instructor for two of their store locations. Kim was also Head Trainer for Invisible Fence for 6 months. In 2004, Kimberly became a Certified AKC Canine Good Citizen Evaluator and added Canine Good Citizen classes to the growing list of services offered by Teacher’s Pet K-9 School. She also began training Basic Obedience classes for the Hampshire Park District. In 2007, Kimberly expanded the business to Genoa for a second location for Teacher’s Pet K-9 School. Offering Doggie Day Care in that facility as well, with a web cam so clients could view their pet playing at day care online! Obedience, Agility and group classes were also held in the Genoa facility. Also in 2007, Kimberly became the Exclusive Trainer for Invisible Fence of Northwest Illinois. Using her past experience training for Invisible Fence and vast knowledge of breeds, temperaments, handling and training, both Invisible Fence and Teacher’s Pet compliment each other nicely while offering clients the best possible service available. In 2009 Kimberly closed the Genoa location and began building a NEW FACILITY on her property located on Plank Road in Sycamore, which is dedicated to her friend who died in the military. The new facility offers private indoor/outdoor suites for the boarding dogs, heated concrete floors for comfort and cleanliness, is climate controlled and has many more amenities for your best friend! Also at the end of December 2009, Kim gave up training for Petco and Invisible Fence for personal and professional reasons and to concentrate on the new facility. In 2010 Kim added Canine Freestyle to her list of services provided by Teacher’s Pet. Canine Freestyle combines obedience training with other tricks and coordinated/choreographed moves combined with music. This form of training creates an extremely strong bond between dog and owner to enhance your relationship and builds an extraordinary dog handler team. She enjoys this form of training with her Giant Schnauzer and can train customers for fun or competition. Also in late 2010, Kim married her long-time boyfriend and best friend who also loves dogs. Kimberly trains all breeds including rare breeds and specializes in Rottweilers and German Shepherds. Over the years she has owned Rottweilers, German Shepherds, Giant Schnauzers, Belgian Malinois’, Chihuahuas and a German Shepherd/Pit bull mix. She continues to show her dogs in Obedience and Agility. Kimberly believes in positive reinforcement using treats and praise, redirection, as well as correction. She does NOT believe in abusive methods.